We consistently wonder why the 2015 Chevrolet Spark EV hasn’t expanded into more than the two measly states the car is currently sold in. The 2015 Spark EV is currently sold in California, and Oregon, with Maryland sales starting later in 2015. Yet, the 2015 Spark EV outsold the Chevrolet Volt by 15 units. Keep in mind, the Chevrolet Volt is sold in all fifty states. The 2015 Spark EV sold 920 units, and the Volt found 905 new homes. But the real story is the insane bump in Spark EV sales after the car’s price decrease. In March of 2015, Chevrolet sold 151 Spark EVs. Then, a price decrease of $1,500 came, and a low, very low lease payment of $139 per month, down from $199 per month. April 2015 saw 920 Spark EVs as mentioned, a substantial increase in volume. According to Autoblog, 864 of the 2015 Spark EV sales in April were leases because, let’s face it, that $139 per month payment is mighty attractive. Factor in the savings from gasoline and it looks even better. So the real question of it all is whether Chevrolet is now looking to expand the 2015 Spark EV into new markets. Annalisa Bluhm of Chevrolet communications says GM is always considering new states to introduce the car to, but has “nothing to announce yet” according to the report. A shame, because the teeny-tiny Spark EV would make a great companion to the 2016 Volt. Price and limited availability, two major obstacles for this EV. Nice to see one of them being taken care of, at least somewhat. As for markets, I keep thinking this would sell very well in New York as well. A gigantic market that has many people who have the money but not much room for driving or parking. I am not sure why the Spark is limited to sale in California and Oregon only. If this thing was sold in Ontario I’d lease it. Actually if Chev Canada offered similar aggressive leasing on the Volt as in the States I would likely have one. I think it was the Fiat 500e in California, where there was a lease promo for like 99/month. Anyways, there was a race in Cali and one of the drivers caught wind of the deal, so he and about 20 others went and cleaned out the Chrysler-Fiat dealerships in the area. With CAFE requirements — and a huge demand for full size SUVs — GM needs to expand the sales of Volts and Spark EVs big time. 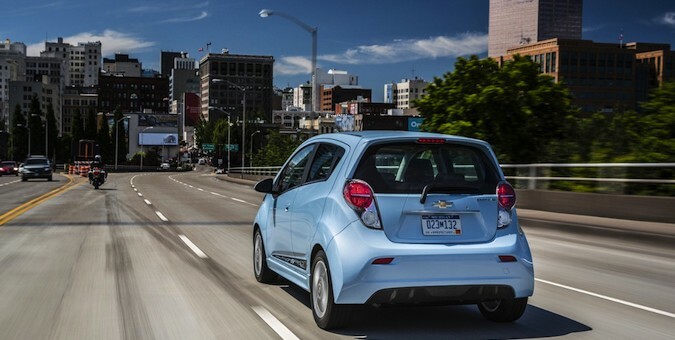 The Spark is ideal for large metro areas where GM traditionally isn’t strong. Time to be agressive GM!!! GM of Canada needs to parallel the US in being agressive too. Or maybe GM Canada likes being in third place in automotive sales behind Ford and Chrysler? Actually, SUV and full size truck sales lower GM’s CAFE rating, so they are kind of helping. A company like Mazda which only has small to midsize vehicles will have to meet higher MPG ratings as a brand than GM. Efficient big vehicles in a lot of ways help a brand meet CAFE than having a small super efficient car.